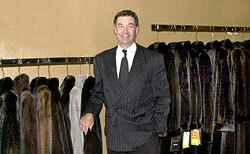 Furs by Martin is a full-service fur boutique owned by Mr. Vincent Martin. Mr. Martin has owned the company for twenty years and has kept his business at the forefront by offering great customer service, diverse selections and great style. Mr. Martin's background began in 1971 when he was dyeing and dressing furs. He then entered the retail market and has worked with notable local Dallas furriers such as James Hirsch and Szor-Diener before starting his own business. Furs by Martin excels not only in selecting fine furs, but also in fur cleaning, storage, trim work and restyles. Customer service is at the heart of who we are. As a boutique, one way we keep ahead of larger fur salons is by giving VIP service to all of our customers. Mr. Martin states, "I like to work with the customers to give them the best quality and value for their money." His idea is to make it easy for a woman to wear and enjoy her furs – anytime, and anywhere she wants. And, it is always a good time of year to buy a new fur. We welcome your calls at 214-363-0072 and invite you to browse through our selections in person at our North Dallas location.